The Day God Died . . . The day God died. The statement itself sounds odd. How could God die? Is not that what makes God, God? Immorality? Yet, when we speak of the annual Easter celebration we are talking about remembering His death. Jesus was considered by many of His followers to be God of heaven and earth in human flesh. Then He died a scandalous, torturous death. No doubt it left His followers confused and perplexed. How could someone who claimed to be God and did all sorts of miracles to verify it literally die before their very eyes? Sin is many things. It is the pride, selfishness and rebelliousness of a person’s heart. It shows itself in practical ways through lying, sexual immorality or unforgiveness. 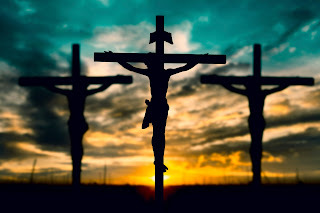 Ultimately, it is a darkness that lay in each heart human that required the greatest force in the universe to advance against it - Jesus and His cross. He humbly laid His life down on that cross and only He could have done it. As God Himself, He was sinless, perfect, without any fault. One sinner could not provide forgiveness for another sinner. Only a perfect man could provide forgiveness for an imperfect one. Jesus was humanity’s only hope. He lay Himself down to become mankind’s sin-bearer. He who was without sin willingly bore the sin of the world. God gave of Himself, for His own creation. Why did He go to such lengths? Love. He saw where the path of a self-righteous and wicked heart led. The destruction it created in this life and the eternal pain in led to in the next. Compelled by love God died . . . then rose again. Yes! He rose from the grave defeating the power of sin while securing forgiveness for all who call upon Him in belief and repentance. Let the greatest power in the universe sweep clean the darkness of your soul today and bring new life.